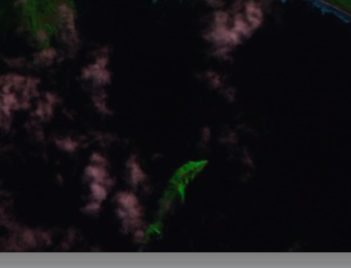 Part of the hunt for kelp beds on Floating Forests is focused on Tasmania; while checking satellite images from the area, user Rondine spotted a big green dolphin in the bottom of one image! Okay, it may be in the sea, but it’s not an actual dolphin (dolphins aren’t green, and are quite a bit smaller). It’s actually the Ile du Golfe, a limestone island, and no, we’re not the first to notice the rather interesting shape. But it does show up very nice here, and, for the record, real dolphins do swim in Tasmanian waters. Help with the hunt for kelp at Floating Forests! Previous Previous post: New Project: Season Spotter!